Justice Allen Loughry, left, and attorney John Carr leave for the day Wednesday after the jury recessed until this morning in Charleston. 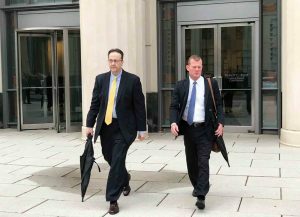 CHARLESTON, W.Va. — After a morning filled with last-minute appeals by the prosecution and defense, the jury determining the guilt or innocence of Allen Loughry, a justice of the West Virginia Supreme Court of Appeals, began its deliberations Wednesday afternoon. After about an hour of instructions from U.S. District Judge John Copenhaver, the jury was dismissed to start its deliberations. The jurors will return to the Robert C. Byrd Courthouse today at 9:30 a.m. to continue their deliberations.